First, THANK YOU! I sincerely appreciate all of your encouraging comments on my last post, as well as the abundance of emails and messages I received. 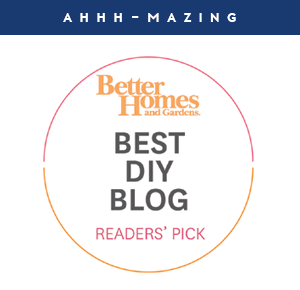 This community really amazes me, and I adore that we all bond over a passion for our homes and organization! 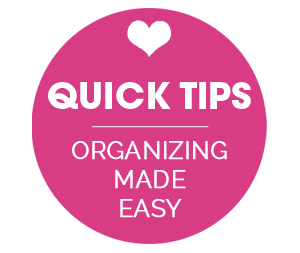 It sounds like many of you are on a quest to simplify and reduce home clutter with me this year, which keeps me awake at night with excitement! Let's do this 2019! I have always been a bit of a sentimentalist, and I really love giving gifts to friends and family throughout the year. Just as much as I find joy in the process of looking for something thoughtful to give, I also really enjoy the process of wrapping it all up! 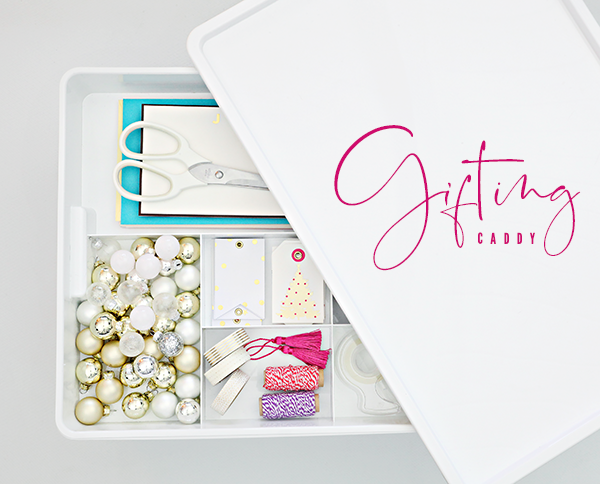 I have absolutely nothing against a gift box or bag, but sometimes it just feels a little more special to add a ribbon, embellishment, a handwritten note, an ornament, monogrammed tag, etc... And those extra touches don't have to take much time, but they really go along way. Five years ago I put together the ultimate gift wrapping station. It had extra of everything from twine, bows, bags, boxes, tissue and quite a few rolls of gift wrap. It was epic and went viral and I don't regret the project for a second. It served me quite well over the years, and it has taken me a long time to work my way through a lot of the supplies and cards. But it was a bit much. And over the years as the nearby counter became cluttered with toys and Lego builds, I would gather my supplies and take them to my office or the kitchen table to do my wrapping. In my quest to reduce and simplify this year, I decided that it was time to downsize this part of my life in a way that takes up less space and offers some portability. I actually put all of this together last month before Christmas, and it couldn't have worked out better. And because I can still use it year-round for anniversaries, birthdays, and just-because days, I decided I would share the tote-tastic idea with you! I began with the large KUGGIS bin found at IKEA. 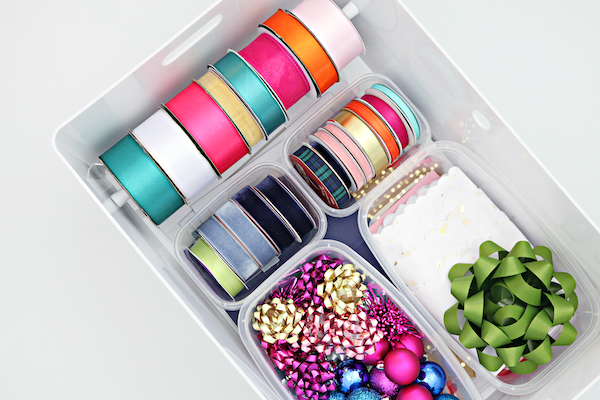 I have used smaller versions of these bins and I absolutely LOVE them. They really have become one of my "go-to" storage items as of late. However, this is my first time using this particular size, and I was ridiculously eager to try out the addition of the divided organizing tray that tucks away nicely inside. 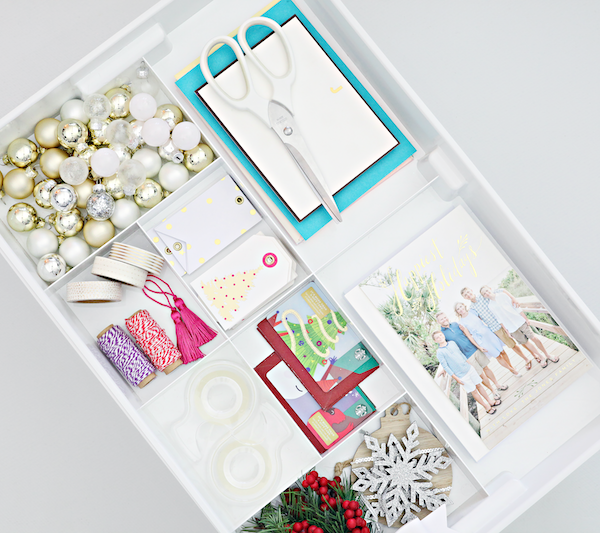 The top tray is really great for smaller embellishments and cards. 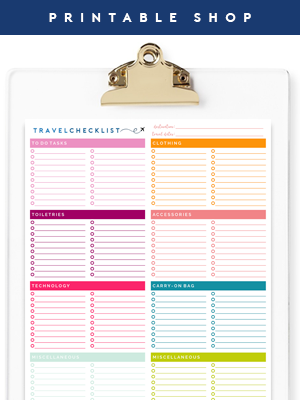 It can also fit a smaller address book (if you are old-school like me and still use one of those during the holidays). If I am at a stationery store and spot a nice greeting card, I pick them up so I can be prepared ahead of time for special dates or for those celebrations that come up last minute. The larger areas of the tray are a really wonderful size to fit all of those greeting cards, thank you notes and envelopes. I also like to add tags, ornaments, bows, etc... and the smaller divided areas are a nice way to divide out the tapes, twine, and gift toppers. I also keep a few gift cards on hand to hand out randomly when the mood strikes (I just put a small amount on each and will give them to strangers or kind employees as a random act of kindness). There is more magic happening below the tray, which is completely removable. The nice thing about this bin is the amount of space/storage to keep everything all together. The base of the bin is a nice size for gift bags, boxes and larger sheets of tissue. I found some food storage containers at the dollar store to add a little extra division for the bows, tissue and smaller ribbon spools. They are light-weight and inexpensive and couldn't have worked out better. I used a small tension rod for my larger spools of ribbon, placed at the outer edge of the bin. It is easy to be removed if I need to swap out a roll but stays in place for grabbing a quick bit to add to a package. I use a small piece of masking/painters tape on each spool to keep the ribbon from loosening inside of the bin in-between uses. Above you can see the entire bin in action and how everything stacks in a compact and portable tote. I have also really condensed my gift wrap rolls down; I find it best to actually only purchase solid craft, black or a simple stripe/dot gift wrap that can be versatile year round. 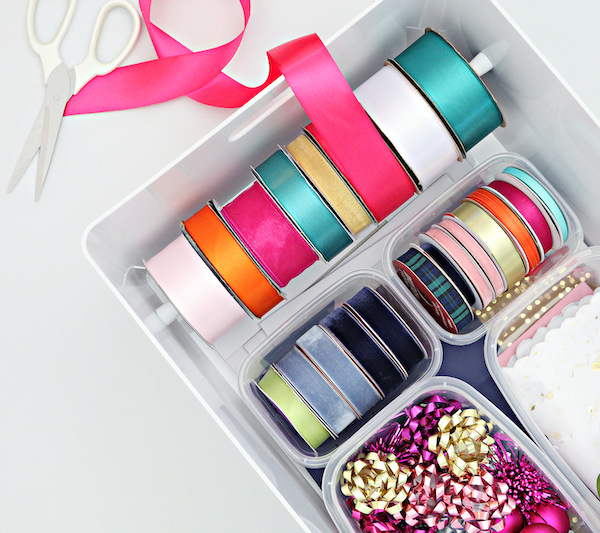 That allows the ribbon and toppers to shine and also keeps the number of rolls that I have to store to a minimum. I currently just keep them in a corner of my office closet until I can finish up with a little refresh of that space in the near future. 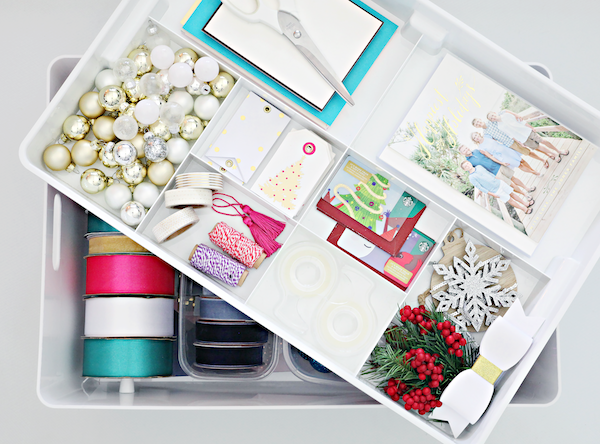 I was able to condense my large bookcase of packaging and gift wrap items down into a mobile gift wrap station and it couldn't have worked better this past Christmas. 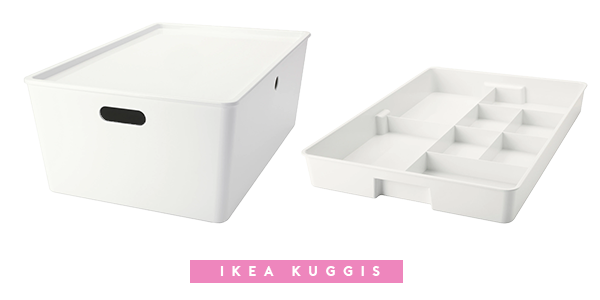 Also, I am totally sold on the amount of storage and functionality this KUGGIS bin offers! I have also seen the tray insert used inside of a drawer as a divider for tech and office gear and it was brilliant. 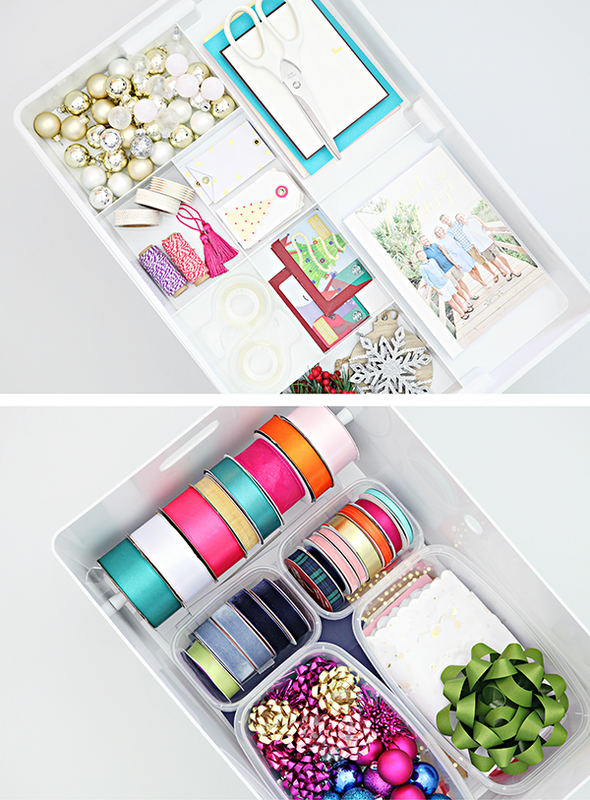 So tell me, have you tried these bins and if so, how do you put them to use around your home? This is so lovely - and just in time for all our late winter birthdays! Thank you for sharing these bins. I have seen them at IKEA but never really looked at them. 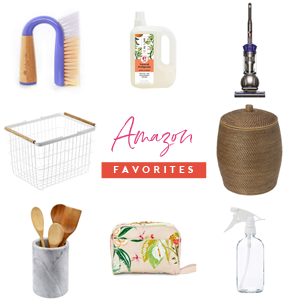 We are currently remodeling our kitchen/living area so I am on the hunt for storage solutions. Great ideas in this post! Question: what do you do with the lids of storage items (such as the dollar store food storage containers in this post) when they are not in use? I love those Ikea boxes! They look so sleek on a shelf and are so versatile! I popped a divided tray in the top to sort tape, pens, tags, scissors, etc. It rests on top of a stack of small gift bags and tissue paper. 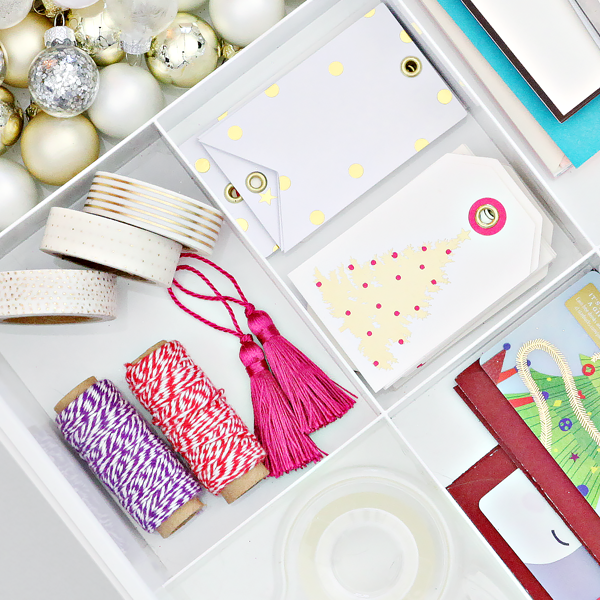 In the bottom compartment, I keep all of the ribbons and bows and a stash of small gift boxes. It works great because I can just access whichever compartment I need quickly and it's portable. 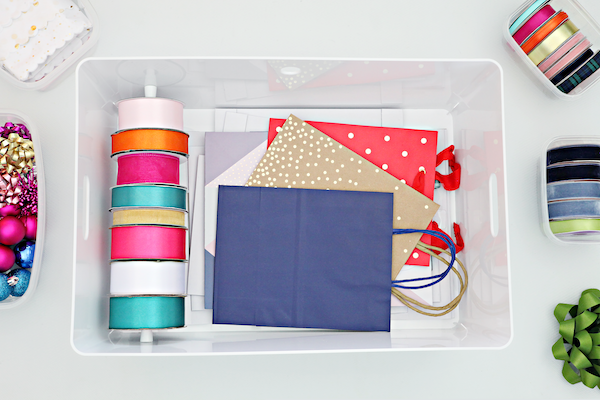 I am so glad you mentioned the stacking latch bins, I have used them for kids crafts and really love them! Where did you find the tiny rod for the ribbon? What should I be looking for? I LOVE the idea! It's a tension rod, if you are using a similar sized bin you will want one that can expand between 11-18" inches. SO happy you are back and sharing your amazing skills & heart!! I was just going to send you a message this week, and then checked your site and saw these two posts. I'm selfishly glad you are back, but also very happy you've taken the time you've needed for your life. My two main house related goals are paper and photos. It is absolutely out of control. Most of the paper relates to all the sentimental/school related items from my 17 & 13 year olds. And as far as photos go, I'm honestly thinking of investing in a somewhat expensive photo scanner just to get them all safe and sound. Living in SoCal, it's a constant worry that another fire will rip through our neighborhood. My in-laws lost their home 10 years ago, and it's heartbreaking not to have many pictures of my husband through the years. Anyway, wishing you the best for 2019! oh TWO posts in a matter of days!! xoxo I had just got onto your blog to see if I missed an email post notification just before your "I'm back" blog post the other day. I have been thinking of you and always enjoy your posts/info/light/face!! It's always good to 'see' you and sending you strength in whatever you are going thru. The tension rod IN the tote...=GENIUS!!! I really needed this post today! After cleaning out my gifting basket pre holidays and now it’s a mess again only just after it’s time for a new method!! I'm so thrilled that you have another new post! I've missed you! I'll be honest, I can stay plenty busy by looking back at your old posts to help me with all of my projects. But it's nice to see you back and I hope all is well. Ahhhh I am so happy you are back!!! 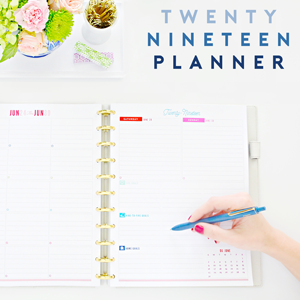 Can’t wait to see what you have planned for this year! Your getting your grove back! Love this! Oh I should try this! All of my gift wrap supplies are loose in a ripped gift bag. It's hard to find things!